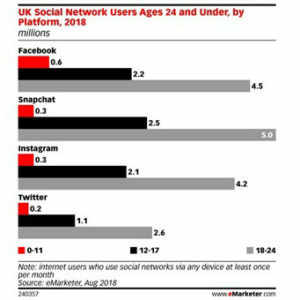 Snapchat will have a larger user base among UK adults ages 18 to 24 than Facebook in 2018, according to new research. The data, from eMarketer’s latest forecast on social network usage, indicates that the number of Snapchat users in the UK will reach 16.2 million this year, of which 5.0 million (or nearly 31%) will be between 18 and 24. By comparison, the number of UK Facebook users ages 18 to 24 will total 4.5 million, down 1.8% over 2017. Instagram will have 4.2 million users in this cohort, and 2.6 million will use Twitter. 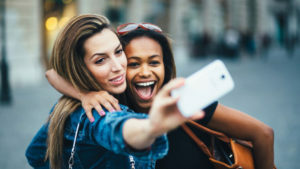 While Facebook-owned Instagram is growing its younger user base, our forecast indicates Snapchat will retain the upper hand in that category in the coming years. eMarketer’s forecast also shows that mobile Facebook user growth has started to level off, suggesting that many younger social network users are forgoing Facebook altogether in favour of more appealing mobile-first alternatives. eMarketer defines a social network user as someone who accesses their account at least once per month. See attachment for a detailed explanation of eMarketer’s methodology for Monthly Active Users (MAUs). One Response to "eMarketer: Snapchat in UK ‘to overtake Facebook among 18-24-year-olds this year’"